Looking for all of the latest in outdoor Christmas lights? We offer a wide selection of everything you’ll need to make this holiday season bright. How many times have you gone to the store to buy outdoor Christmas lights only to find that what you wanted is sold out? Here you will find every type of both indoor and outdoor light you could possibly want and more! There are literally thousands of different types of outdoor Christmas Lights to choose from. Here we’ve broken down every type of light you could possibly want and categorized them for easy selection and purchase. LED outdoor Christmas Lights are constructed with zinc coated lamp contacts that are rust proof and have virtually indestructible epoxy lenses. Benefits of up to 90% in energy savings make them the clear alternative to traditional lighting. The Christmas lights decorations you grew up with and the most popular. 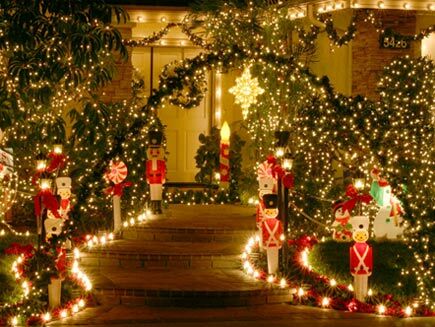 Choose from the best mini lights, twinkle lights, micro, icicle styles and more. These can be as cheap as you want or as extravagant as you’d like. These are very flexible and are not limiting to usage during the holidays only. During the Christmas season, shape them into candy canes or wreaths to enhance your home’s outer décor. After Christmas, use them to outline your deck or outdoor cantina. Choose from lighted ball spheres, star decorations, grape clusters, lantern ideas, large or small animated reindeer, battery operated displays, solar powered driveway lights, holly berry leaves, waving Santas with sounds, fireplace swag, train decorations for outdoors, net lights to put on shrubs and bushes, wreaths to hang on doors and more. 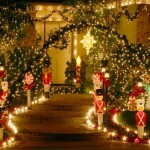 These decorations can be used to give a modern or classic edge to your outdoor Christmas lights. Items you might need for commercial outdoor Christmas lights range from commercial grade lights, giant artificial lighted Christmas trees, pole mounts, classic silhouettes and more. Both C7 and C9 string lights offer a traditional style for outdoor lighting. If you want the look of the C7 or C9 without the energy waste, try LED retro fit bulbs. Classic colors like blue, red, green and white are most popular. Clips, timers, extension cords, controllers, hooks, hangers and all other hanging necessities. Find the right size, shape and colors for decorating your outdoor trees or artificial outdoor Christmas trees.